A multi-cast audio book featuring Tony and Golden Globe winner Linda Lavin, The Love Boat's Gavin Macleod, Tony and Emmy nominated Lainie Kazan, The Nanny's Renée Taylor, Grammy nominated Judy Tenuta and many more. Her devoted family only wants the best for their Bubbie. Mostly they want to ensure that their matriarch's twilight years are spent in comfort, safety, and serenity. But how do you manage an aging, immutably stubborn Holocaust survivor who has risen above the squalor of Poland's ghettos; fled across the war-torn German wilderness; and survived the winter-ravaged Pyrenees alone on foot with three children? You probably don't. 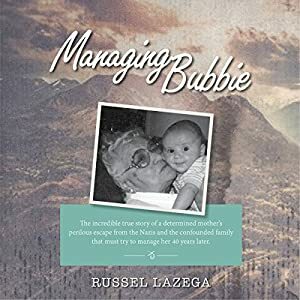 Managing Bubbie is the heartrending, hilarious family memoir by Russel Lazega that recounts the frequently hectic, ever-exhausting trials of one Jewish family in Miami Beach as they try to oversee the care of the elderly, unmanageable Lea Lazega. As they scramble for an acceptable assisted living facility and struggle to get her medication in line, they discover the difficulties of controlling a woman who time and again eluded catastrophe by refusing to be told what to do. A tapestry of an American family in the 1980s, Managing Bubbie also revisits the Holocaust period to mine the love, hope, and humor that emerged from the deepest despair. Anyone who savors a soft heart with a sharp funny bone will laugh, cry, and commiserate with the confounded family who must manage their beloved, impossible Bubbie. In this gripping memoir, Danuta Pfeiffer grew up with parents as extraordinary as they were flawed. John and Patricia Rylko and their three children lived a nomadic life following the seasons to accommodate John's work as a gifted sculptor during the summers and as a philandering ski instructor in the winters. They lived in a circus tent, built their first cabin, and lost it for a dollar. John Rylko flaunted his charm as a story teller, entrancing all who listened of his wartime glories as a Polish soldier and his silver medals in the 1936 Winter Olympics, while Patricia, a nurse, pulled double shifts at hospitals, hitchhiking to work and feeding her family off the land with roadkill deer and blackberry pies. Those times of resiliency would have to sustain Danuta when she was raped and secretly gave birth to a baby. She escapes her enraged father on a daring journey to Alaska during the storm of the century. Through betrayals and loss and her search for redemption, she becomes the unlikely co-host to a television evangelist bent on becoming the president of the US. When her past catches up to her, she is caught in the crosshairs of politics and religion. In a gutsy move, she abandons Christianity during a bicycle ride from Canada to Mexico and unravels her father's hidden life in the Carpathian Mountains of Poland, only to discover her own life hidden in the folds of resiliency, tenacity, and grit. 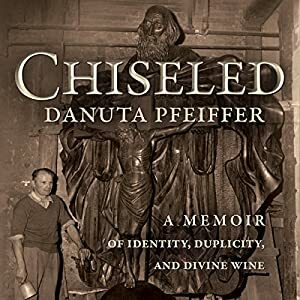 Danuta Pfeiffer now lives in a vineyard in Oregon, making fine wine with her husband Robin Pfeiffer. Make no mistake; this isn't a pity-party or sob-story memoir. It is life-affirming, and you may cry, but you will be inspired! After surviving the cruel rage of tyranny from her mother and ex-husband, Sarah Jackson traveled a new path - a journey of loss, heartbreak, and, ultimately, strength. How do we survive the unthinkable, our child suffering from a terminal illness? Sarah Jackson's life will teach you that despite all the hardships, you will survive, even if at times it feels like you won't. Have you ever wondered, "Who really was Thomas Jefferson?" History tells us he was a brilliant scholar, violinist, surveyor, astronomer, lawyer, planter, bibliophile, architect, founding father, statesman, governor of Virginia, ambassador to France, Secretary of State under George Washington, vice-president under John Adams, the third US president, scientist, natural philosopher, family man, and sage. So much is known about Thomas Jefferson from the drafting of the Declaration of Independence until his death, but little was known about his first 31 years of life, until now! Thomas Jefferson: From Boy to Man is a biographical, autobiographical, and historically accurate account of Jefferson's journey to manhood...an era that was virtually "in the shadows". 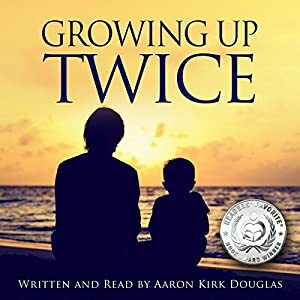 You will learn about his ancestry, childhood, adolescence, family, friends, boarding schools, family deaths, college years, romance, law practice, fire, earthquakes, flood, and more. It is partially spoken in a journal format, and supplemented with background information to further inform the listener. Thomas Jefferson: From Boy to Man provides personal information about our iconic founding father that will help unlock the mystery that surrounds Virginia's most beloved son. As you listen about Thomas Jefferson, the boy, you will realize how his early life years helped shape the personality, character, intellect, morals, and religious beliefs of Jefferson, the man. The audio is filled with emotion, humor, personal reflection, and fanciful imagery, and includes many authentic Jefferson quotes. Many say that Thomas Jefferson was complicated. I say, "In order to understand the man, it is important to learn about the boy." Enjoy listening to Thomas Jefferson: From Boy to Man to unlock the mystery! 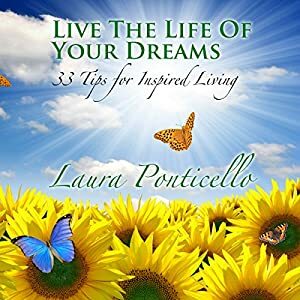 In Live the Life of Your Dreams: 33 Tips to Inspire Your Life, award-winning author and inspirational speaker Laura Ponticello has interviewed women from all over the country to uncover firsthand what inspires them in their daily lives and how they tap in to this inspiration. In doing so she discovered that women feel most inspired when they are empowered. Live the Life of Your Dreams: 33 Tips to Inspire Your Life is a collection of healing graces, healthy practices, and inspirational words to help listeners on their paths to empowerment as they explore achieving personal fulfillment. Real women have provided their personal stories of triumph, sought-after purpose, and acquired wisdom in this audiobook. The book can be listened to at any minute, and a nugget of inspiration can be found. Plus 33 tips for inspired living. This book was recently awarded the Pinnacle Book Achievement Award for Inspiration. 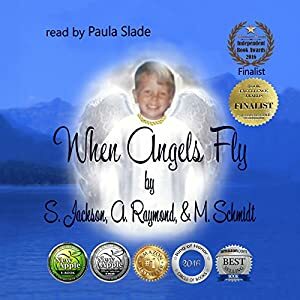 A portion of book sales will go nonprofit organization Postively Pink Packages, which creates breast cancer diagnosis and treatment packages in honor of Laura's grandmother.